This is the largest part of the gardens, and is open to the public at all times and easily accessible from the neighbouring cycle path. 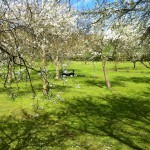 The gardens are particularly attractive in late spring when all the fruit trees are in blossom. Students in particular from the nearby colleges take advantage of the peaceful environment to study for their exams, and pursue other activities favoured by students throughout the ages. 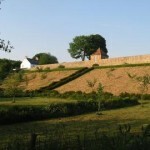 Archaeological excavation in the lower garden did not find any clear evidence of how the gardens were once planted. Any evidence was probably destroyed by deep ploughing in the 19th century. 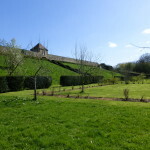 Plans from the 18th century suggest show this area as an orchard, although the restoration has focused on garden styles from the mid-17th century, when the gardens were first developed. 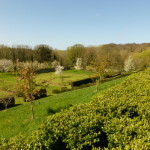 The present layout consists of a damson orchard, and more openly planted apple and pear trees amongst formal borders. In keeping with the early style, all of the varieties of fruit date from before 1650. Here you will find eight rare varieties of apple, including Catshead, Leatherjacket and Golden Pippin apples; Black Worcester pears; Shropshire Prune Damson and Old Greengage. Plans from 1776 suggest that the lower gardens were totally enclosed by walls. 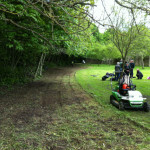 However, sections of the walls were removed in the late 19th century to make space for the nearby railway embankment, which carried trains to Elvet. The remaining sections have been restored, including a 17th century doorway which gives access onto the terrace. So far, we have replaced dead and diseased trees with authentic historic varieties, heavily pruned the formal border, and agreed a new grass cutting regime with Durham County Council. 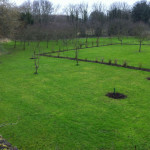 We aim to continue managing the fruit trees and formal border through pruning. Future improvements could be made to the boundary with the public footpath, and filling any remaining gaps in the yew and box hedging. 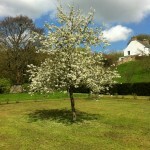 New fruit trees have been planted to replace those which have been lost.